1679, USED RIM, 15x6, 5 LUG, 4-1/2", 89-94, Ford, THUNDERBIRD, Mercury, COUGAR, 39mm OFFSET, 10 SLOT, STEEL. 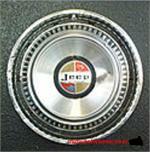 235, HUBCAP USED, 15", 69-79, AMC, JEEP, CJ-SERIES, RENEGADE, CHEROKEE, J-SERIES, JEEPSTER, WAGONEER, 10-SLOT TYPE, WITH HUB HOLE. 239, Hubcap used, 15", 76-88, JEEP, CJ-SERIES, CHEROKEE, J-SERIES TRUCK, WAGONEER, EXCEPT 10-SLOT TYPE, RIB TYPE, WITHOUT HUB HOLE. 239, Hubcap used, 15", 76-88, JEEP, CJ-SERIES, CHEROKEE, J-SERIES TRUCK, WAGONEER, POLISHED WITH, RIBS PAINTED BLACK [RIB TYPE], BLACK RING & DOMES CENTER, WITH RED, BLUE & WHITE CENTER & BLACK WORD JEEP IN CENTER, METAL CLIPS, WITHOUT HUB HOLE. 3071c, Hubcap used, 15", 75-76, CHEVY, CAPRICE, IMPALA, PASS, 10 SLOT TYPE, BLACK POCKETS, BLACK BACKGROUND IN CENTER, RAISED CENTER WITH CHEVY BOWTIE, METAL CLIPS. 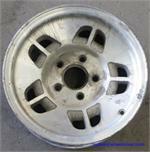 3107b, Used Rims, 15X6, 5 LUG, 4-1/4", 92-93, FORD, TAURUS, LIGHT SILVER 10 SLOT ALUM. 42 MM OFFSET. 3185, Used Rims, 14X6, 5 LUG, 4-1/2", 96-97, FORD, RANGER, ALUM, MACHINED, 10 SLOT WITH 2-1/2" CENTER HUB. 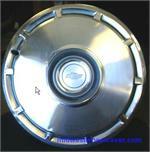 3213, Hubcap used, 15", 93-96, CHEVY, CAPRICE. MACHINED OUTER RING, 16 SLOT TYPE, SPARKLE SILVER, MACHINED CENTER WITH OUT LINED IN CHROME BOWTIE, CHROME CENTER. PLASTIC CLIPS & WIRE RING. 3259b, Used Rims, 15x7, 5 LUG, 4-1/2", 98-07, Ford, Mazda, Explorer, Ranger, B-2500,B-3000, B-4000, Full face painted silver, 10 SLOT. 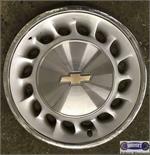 3261A, Used Rims, 15X7, 5 LUG, 4-1/2, 98-01, FORD, EXPLORER, RANGER, MOUNTAINEER. ALUM 10 SLOT/10 HOLES, ALL ALUM FINISH .A & B HAVE DIFFERENT FINISHES. 3261b, Used Rims, 15X7, 5 LUG, 4-1/2, 01, FORD, EXPLORER, ALUM 10 SLOT/10 HOLES, A & B HAVE DIFFERENT FINISHES. 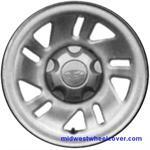 342, HUBCAP USED, 15", 69-71, DODGE, PASSENGER, 10 SLOT TYPE. 3992, HUBCAP USED, 15", 74-76, GMC, SPRINT, 10 SLOT TYPE, GMC LOGO. 4109, HUBCAP USED, 14", 88-89, OLDS, CUTLASS, FWD, ALL SPARKLE SILVER, 10 SLOT TYPE, ENGRAVED LOGO, METAL CLIPS.